Armenia’s authorities have pledged to adopt, within less than six months, a law “On Prevention of Domestic Violence”, which has twice been sent back from the National Assembly and is being amended again. The Coalition to Stop Violence against Women, which has been advocating the bill for years, thinks that there is a high probability of its adoption. Coalition Coordinator Zara Hovhannisyan said that a new report, which provides a more comprehensive picture of the cases of violence against women registered within the past five years, will contribute to the adoption of the bill. 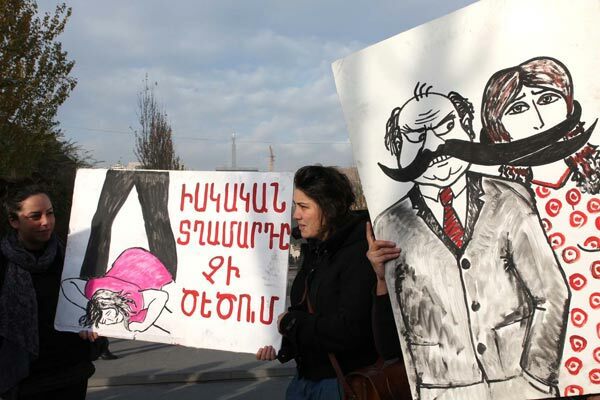 According to the report entitled “Cases of Domestic Violence and Murder of Women in Armenia”, during the period in question, at least 30 women aged 20-40 were killed in domestic violence. In most cases they were stabbed mainly by ex-partners or family members. As many as 26 cases of those murders were committed in homes. A total of 21 of the victims used to live with the perpetrator of the crime, four of them tried to cut ties with the violator, three of the women had already terminated their relationships with violators when murdered, which shows that preventive measures could have helped to avoid the loss of human life. “The draft law includes preventive measures that will give a chance to the victim and the violator to live separately for some time. There are a number of preventive mechanisms. For example, they put bracelets on their hands to keep them away from each other at a distance of at least 100 meters, etc.,” she said during a press conference at Media Center in Yerevan. “According to the latest information we have got, Armenia has taken responsibility by promising some international bodies to solve this issue. In particular, they will provide financial support for constructing shelters in the provinces, as well as take other preventive measures,” she added. “Killing women affects the fate of children. In all cases the perpetrator of the crime and the victim together took care of at least one child. As many as seven children witnessed their mothers’ murders. As a result of the attack three of them received injuries,” she added. Women’s rights champions are convinced that shortcomings, as well as indifference and inaction of the law-enforcement and judicial bodies impede the prevention of such violent acts. According to the report, in the last five years criminals, who had killed women, were sentenced to an average of nine years of imprisonment. Only four of the 30 criminals are still in prison. “There is no verdict in connection with 16 of the cases, even though a long time has passed. No case has been initiated in relation to one of them: the case was classified as a suicide. At the same time, the course of investigations in nine cases is still unknown,” said Jilozian.